Singapore has positioned itself as a living laboratory of new technologies by creating a business environment that enables startups to flourish and realize their full potential, said Yip Wei Kiat, Singapore’s ambassador to South Korea. “Singapore’s government officials rarely say no to startups, even if the new ideas presented by startups do not match the current regulatory system,” the ambassador said in a recent exclusive interview with Maeil Business Newspaper. “We try our best to find a solution to help startups,” he said, adding that the government reveals the contact information of all departments so that they are made readily accessible to startups around the world. The city state of 5.6 million is a global financial hub, home to some of the world’s largest banks and financial institutions. Lately it has emerged as a breeding ground for budding entrepreneurs in the fintech sector. The number of fintech startups in the city now totals 450. It also landed six firms on KPMG International’s 2018 list of top 100 fintech companies, up from two in the previous year. In Korea, only two firms made it to the list: Viva Republica, creator of the mobile payment app Toss, and Dayli Financial Group, a blockchain platform provider. Contrary to Korea, whose rigid regulations have largely been blamed for the stunted growth in fintech, Singapore has embraced early on a regulatory approach that allows new companies to experiment with fintech innovations. Singapore was the first in Asia to introduce a “regulatory sandbox,” which enables fintech firms to test out new business models in a live market under a controlled environment. First launched by the U.K. in 2016, the framework allows companies to fine-tune their services while enabling governments to identify potential risks and set up the necessary safeguards. Singapore introduced its own version of the fintech sandbox in 2016 and has started seeing the rise of startups benefiting from the system since 2017. In Korea, a bill to establish a regulatory sandbox is set to pass this year after more than four years pending in the National Assembly. Yip also noted there are many potential areas for cooperation between Singapore and Korea, especially in urban solutions. “The two countries can work together on developing the regulatory framework to facilitate or manage the issues that arise in implementing smart city projects,” he said. One area of key interest is autonomous vehicles. Singapore is eager to join hands with Korean companies to advance development in autonomous driving, Yip said. He pointed out the partnership between Grab, Singapore’s ride-hailing company, and an MIT spinoff called nuTonomy to launch the world’s first public trial of a driverless taxi service in 2016. A self-driving shuttle bus is also set to go on trial at the National University of Singapore campus this March. E-commerce is another sector with vast potential. 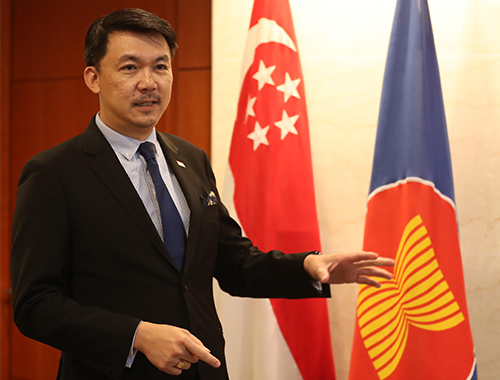 While e-commerce is well-established and relatively mature in both countries, Yip said there is still “a lot of potential to tap into” in the broader ASEAN region and called for joint efforts in building an efficient logistics and payment system.